After self-proclaimed atheist "Rosa Rubicondior's" failure in engaging me in a debate during the summer of 2012, this character has since taken an unhealthy attachment towards me - well at least my "Sacerdotus" handle. This individual now stalks me online! Furthermore, this troubled individual is composing libelous blogs claiming that I am a failed seminarian, that I was part of "St. Joseph's Franciscan seminary" (which does not exist mind you) and is confusing me for a child who happened to use the "chi rho" symbol on his school profiles. 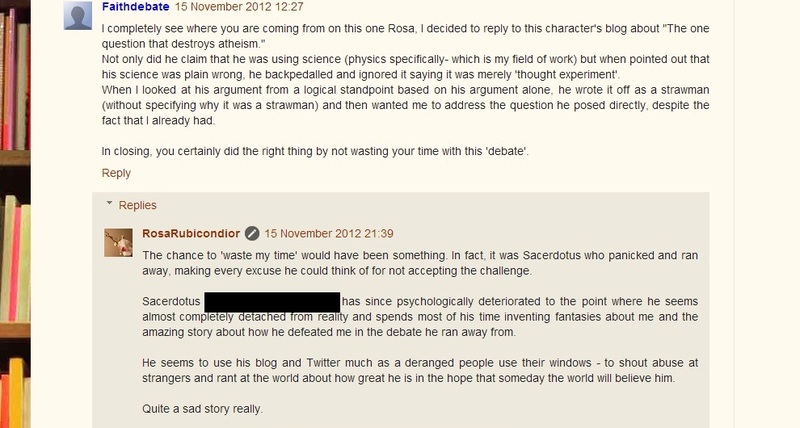 It is sad and disturbing that "Rosa Rubicondior" continues to abuse this child online. I am glad his parents filed a report at both the US and UK consulates regarding this abusive individual whose obvious poor mental state allows for the abuse of a child without any concern. If that is not bad enough, now this other individual "Faithdebate" on youtube is also venting his frustrations against me after I corrected his misunderstanding of physics when he commented on my Rationally Faithful blog. These individuals are all "bark and no bite."